The MIND diet has become very popular in the last few months among health conscious consumers. The reason makes sense. It combines ingredients from both the Mediterranean diet and the DASH diet to improve brain health. The specific focus is to prevent dementia, heart disease, and memory loss. But it doesn’t stop there. 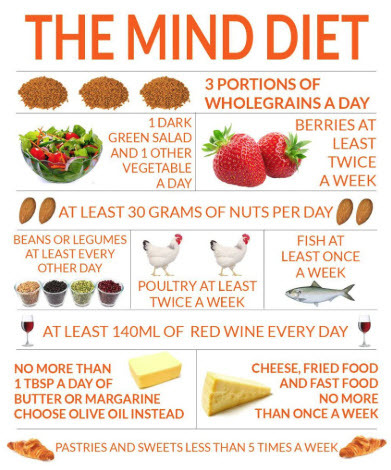 Indeed, other benefits of the MIND diet are weight loss and reducing the risk of chronic diseases. This diet made U.S. News and World Report’s best diets of 2019. MIND specifically stands for the Mediterranean-DASH Intervention for Neurodegenerative Delay. This name sounds very complicated, but in fact, the diet is simple and very easy to follow. It focuses on eating from 10 brain-defending foods on a regular basis. Poultry: chicken or turkey twice a week or more. Not to be fried. Olive oil is the key. It should be used as the main cooking oil. Also, avoid frying any foods. Frying can cause many bad things, such as high cholesterol, weight gain, and high blood pressure. Plus, it’s not good for your heart. If you can’t get through the week without some fried, then just have it once a week. Also, limit and totally avoid butter and margarine. Limit your intake of cheese and wine, red meat, pastries, and sweets. This diet has many things to recommend itself to you. It focuses on whole nutritious foods that are rich in vitamins, minerals, fiber, and antioxidants. It also limits your intake of sugar. The end result is that adhering to the MIND diet can decrease your risk for heart disease, type-2 diabetes, and cancer. You will also see a return to normal blood pressure levels and improved digestive health. Published research studies also show that this diet reduces inflammation, which is a contributor to premature aging and chronic disease. For example, one study of a thousand senior citizens, those who followed the MIND diet most closely had a 53% lower risk of developing Alzheimer’s disease. Research has also already shown that the Mediterranean diet is also good for your brain. A recent review of studies linked the diet to better memory and less cognitive decline not just in older adults but in younger people as well. Try it, you have nothing to lose and everything to gain. You can start off by getting a nice glass of wine and toasting yourself: To my Health.